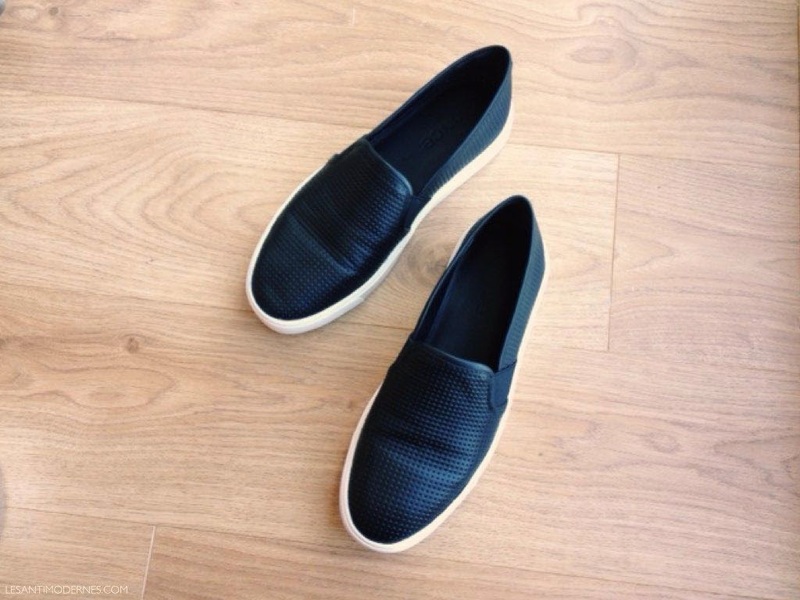 new year, new shoes (and a review!). 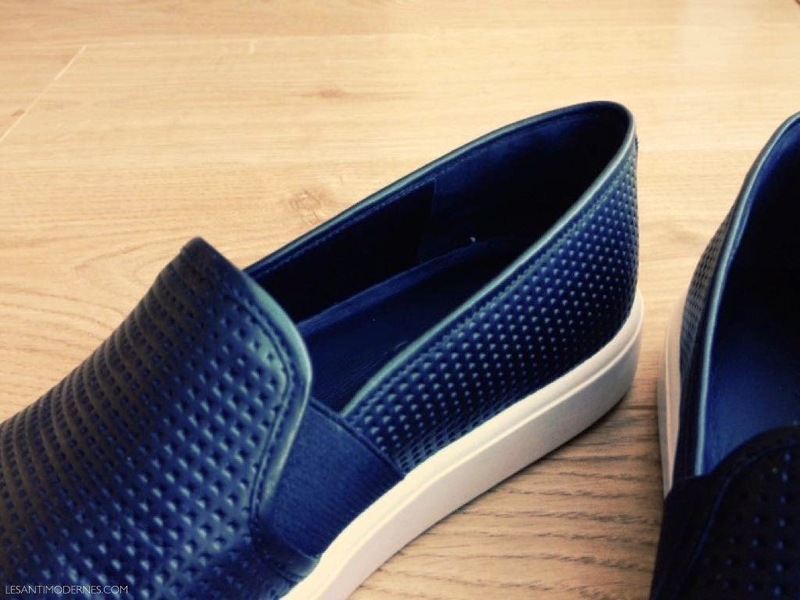 the design: it's a luxe take on the classic Vans, but subtle tweaks in the details make the Vince version chic enough to style with casual and dressier pieces (i think these would look great with trousers or a silk dress). the elastic side tabs make slipping these on and off super easy. the materials/quality: these are quite expensive as far as sneakers go, so i had high expectations for the leather and finish. so far i haven't been disappointed and am quite pleased with the substantive rubber sole (has a good weight to it without feeling overly clunky). i am also generally not a fan of perforated leather (the usual flimsy-looking 'polka dot' kind), but the perforation on these are reinforced small squares and look pretty durable. the leather uppers and lining are thick enough while still remaining supple. my favorite detail is the super cushiony leather insole that adds a real dimension of luxurious comfort to the overall shoe. the fit: they definitely run a half size large, so i sized down to the US 6 and they fit just right with a little room in the toebox and no heel slippage. (i'm a regular width US 6.5 with narrow-ish heels.) no breaking in required, and comfy right out of the box. the look: the vibe is elegant tomboy, which in my opinion is always a good idea. a little throwback to 90s grunge (probably what i'm subconsciously channeling in the outfit above). in spite of being thicker-soled sneakers, these give your feet a sleek, streamlined profile. worth it? yes. if you're someone who insists on style and comfort in equal measures, these are a great buy and will probably become your everyday and travel go-to. what do you think? do you have these, or a similar style? Wow, you look so comfy and stylish! I've been trying to find these in UK forever. Looks like I'll need a US4.5 size, which doesn't exist I bet. I have narrow heels too. I have the taupe woven Vinces, and they are my new favorites. Old Levis, slouchy gray Madewell cashmere sweater, Vince sneakers. Done:). ooh interesting. though i wonder if that's also because Choos run small as well. I just can't get w/ these. I haven't worn sneakers in 45946976590 years, and I don't like the white soles. Maybe if they had a dark sole verison I would be more warm towards them. They look great on you though. I am not a big fan of these. Also, these are rubber soles and leather upper, not worth too much money in my opinion. I have a pair of grey quilted woolen slip-ons that i wear a lot. My criterion is not so thick sole ( eek to platform like shoes ) and not overly contrasting colors like black and white ( high contrast is not my style). I was really happy when i found my light gray+white pair. Although, i feel like i fell prey to a trend, i would like to see how much i will like mine a year from today. to each her own :) though i find the leather uppers on these good quality IMO. wool quilted slip ons sound quite cozy! I found a pair of dupes in the Sam Edelman lower priced line, "Circus." They will last as long as the trend, they're comfy, and I didn't have to spend a ton! I'd highly recommend them, and they also run about a half size large. Just want to know what size you take in Everlane chunky knit? Like you, I'm between xs-s and not sure how the fit of chunky knit is. Thanks! Love the sneakers. They look great on you. Super chic. I agree they're a much more refined pair of Vans! How did I miss that post? You look so great! haha, i can see why! i've been just slipping these on and running out the door.